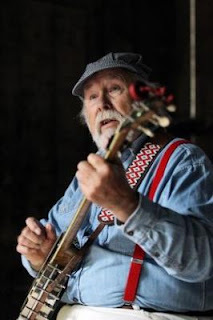 Thanks to Alec Somerville (see the BIB post of 15 Sept. 2012 for an outline of Alec's past achievements) for the news that - as last year - he will be giving a clawhammer banjo workshop as part of the 5th Moniaive Michaelmas Bluegrass Festival to be held in Moniaive, Dumfriesshire, Scotland, at the end of this month. This year's Moniaive festival - the 'Wee European World of Bluegrass Festival' - takes place on the weekend 27-29 September; Alec's workshop will be on the afternoon of Saturday 28 Sept. The organiser, C. Paul 'Dobroman' Lyttle, a regular attender at Omagh festivals, has always included a strong contingent from Ireland on the bill. This year's programme includes the Broken Strings Band from east Ulster, the Watery Hill Boys from Drogheda, Co. Louth, and the phenomenal young band Cup o' Joe, who must have impressed anyone who heard them in jams or public performance at Omagh this past weekend. Just to let you know Alec Somerville will be making a welcome comeback to MMBF this year where he will be teaching clawhammer banjo.